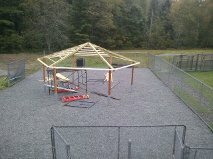 We pride ourselves with originating the idea of a Doggy Daycare in Bangor/Brewer area. Since 1995, we have operated a Doggy Day Care Monday through Friday from 8:00 a.m. to 5:00 p.m. Our original idea was to provide a place for working owners and owners of energetic dogs to leave their dogs to burn off extra energy. 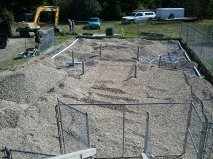 We took our training room, added a large outside fenced area, wading pools, and agility equipment. Holly Staples is Bear Brooks Daycare Director. Holly has a wide variety of experience with large and small dogs. Her stability around animals makes her an exceptional Doggy Day Care Operator. 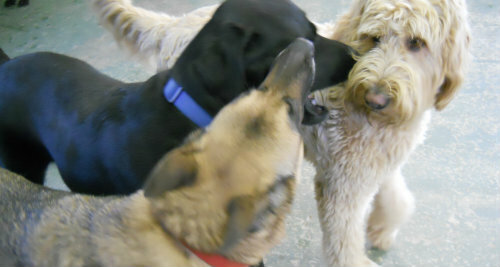 Holly and her assistants play games with the dogs, celebrate birthdays, and supervise all group play at all times. 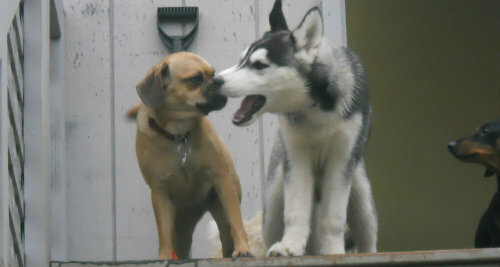 Your dog romps about with other dogs compatible with their size and energy level. Dogs may go home damp from the wading pools, or have drool on them from playing with other dogs, but they always go home tired and happy!! Each dog is interviewed and evaluated before they are allowed in with the play group. Holly introduces each dog slowly as not to overwhelm them. Holly will observe your dog closely and report to you at the end of the day on his or her progress. Our Day Care is set up with certain days of the week set aside for certain types of dogs. To see more about what that means, see our “Day Care Schedule” tab under the “Day Care” menu option. Our Doggy Daycare Application and New Client Form need to be filled out if you and/or your dog have never been at Bear Brook Kennel before! Holly has been with us since 2007 as our Day Care Director. She also has worked as a kennel tech, as a receptionist, and as a training assistant. She has taken a Dog Day Care: Beyond the Leash seminar to help further her knowledge of dog behavior. She has worked with animals for over 12 years, can read the dogs very well, and all the dogs in Day Care love her! She has always owned dogs and loves interacting with them in the Day Care setting. Her hobbies include dancing at Native American pow wows, making native regalia, doing bead work and other art-related crafts. She also recently illustrated a children’s book called Peace is Different by Cindra Cleaves Simpson, which she is very proud of! She has a 12-year-old Pembroke Welsh Corgi named Willow who loves to play and is always happy with a never-ending supply of energy. He doesn’t seem to realize he’s getting old! Daycare has gotten a new look outside! We have different prices and packages depending on your Day Care needs! You select the dates your dogs will be attending, and those days will be held for you. You will be charged even if you can't make it as space is limited and we will reserve the date for your dog. By the day is best if you only plan on coming sporadically. Our daily doggy rate is $22 per dog. The Prepay Options are best if you plan on bringing your dog(s) fairly consistently. It makes it easier to pay in a lump sum, so you don’t have to come into the office every night you pick up from Day Care. It also is less expensive because prepay options can be only $19/day for Day Care. When you prepay, you cannot use prepaid days to cover previous days that are still unpaid on an account. For example, if you have a balance of $22 for Day Care and wanted to purchase a prepaid package, you would need to pay off the $22 along with the prepaid package cost. You will need to designate which days you would like to use for your prepaid package. What Dogs Come on Which Days? Regardless of the day of the week, Day Care is run the same way. 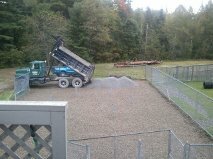 We have drop off between 7:30 a.m. and about 10:00 a.m., at the latest. At 12:00 p.m., the dogs are put into crates in the “Day Care Leisure Room” where they stay for about an hour while the Day Care Attendant is at lunch. After lunch, they are let back out to romp around for the rest of the afternoon. The dogs can run in and outside all day long. 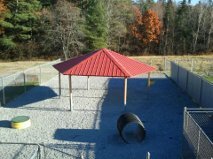 They have access to a large, fenced in area outside with some equipment to play in and a gazebo in the middle to keep the sun/rain/snow off the dogs throughout the day. During the hot summer months, there’s also a wading pool that gets filled up every morning with cool water and refilled as needed for the dogs to play in! Boy, do they love it! They have access to fresh water all day long. We don’t feed dogs during Day Care unless the owner requests it (usually for a puppy). The Day Care Attendant does sometimes give a treat or two at lunch to get the dogs into crates so if your dog has food allergies, feel free to bring in some own food/treats that the dog can have. If dogs that come to Day Care have any serious allergies, such as allergy to spider bites, fly bites, bee stings, etc., feel free to bring in a few pills to keep upstairs in case it is needed. These are the days we generally have the younger, newer dogs in Day Care. The dogs on these days play well with most dogs and aren’t as rowdy as our Tuesday/Thursday dogs. Mondays are also our “Evaluation Days” for new Day Care dogs that are 30 pounds or more. Evaluation Days are when clients bring their dog in between 7:30 a.m. and 8:00 a.m. to meet with the Day Care Attendant, who will show the new client the ropes of Day Care, so to speak. This also gives us an opportunity to introduce the new dog slowly to the group. If the new dog were to come in after this time, it is harder to give the new dog time to acclimate to the group little by little because all the dogs are already loose in the Day Care room. These days are the days we have the bigger, rougher, rowdier crowd. These dogs have usually been here for a while and can handle rambunctious play all day. These days also have a good number of larger dogs that might not get along so well with medium sized breeds that may come to Monday/Friday Day Care. If owners wish, their dogs may be able to come four days a week, that is Mon/Tues/Thurs/Fri. However, this is entirely up to the Day Care Director and how she feels the dogs would fit with the different groups. This is something to be discussed with the Day Care Director after she has had some time to evaluate the play style of the dogs that would like to come more often. Dogs that start out as Monday/Friday dogs may be bumped to Tuesday/Thursday if they become overly rowdy in their play style with the other dogs on the Monday/Friday days. Wednesdays are reserved solely for small dogs and puppies. The cut off for size is about 30 pounds. Same fun and games but the little dogs just don’t have to compete with the larger, over energized dogs. We have a range of small dog sizes on this day from Corgis to Pomeranians to Shepherd or Lab puppies to Malteses and Bichons. For our “Small Dog Day,” we have an evaluation day done on a Wednesday. The specific Wednesday is set up through our Day Care Director after she reviews the application submitted for the dog. 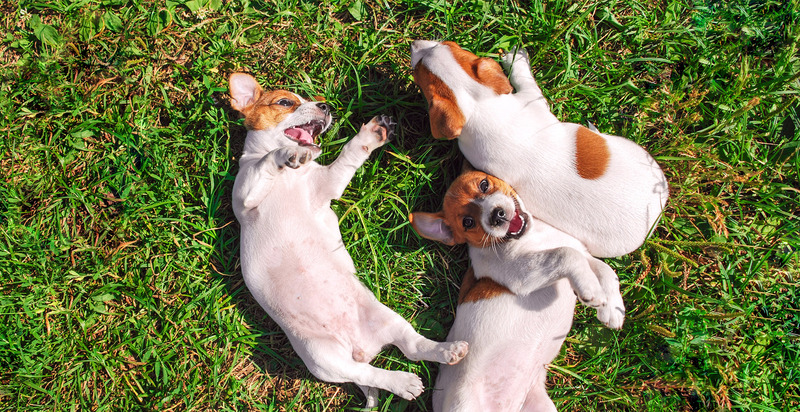 Medium to large breed puppies that start out on Wednesdays when they’re young and under 30 pounds can be moved to Monday/Fridays at any time as the Day Care Attendant sees fit. This usually means that the dog has outgrown the current play group of small dogs and is ready to start playing with the bigger dogs!